A successful anti-corruption policy must eliminate corruption or, at the very least, reduce it drastically. It must cleanse the nation of this scourge of society and instill in the people a fear and an abhorrence of the dreaded disease in all its visible and insidious forms. In modern parlance, it must arouse the attitude of zero tolerance for corruption which is the mark of a truly progressive country. A tall order for the remaining five years for a cleansing that may need five terms of concerted government efforts. Moral cleansing is no simple matter when the culture of bribery and corruption has been allowed to fester under the umbrella of growth and development. It is not easy to redirect the moral and ethical kaabah of the rakyat grown used to abundant worldly rewards. It will be a challenge to reinstate the less lucrative values of honesty and uprightness. In this moral-ethical paradigm, the answer begging question is: For Malaysians who are proud of their diverse ethnicities and faiths, faithful in preserving their religious and cultural heritage, and dogged in executing the prescribed rites and rituals, why has corruption become entrenched in their work culture? Why do ardent followers of a religion propounding goodness succumb to bribery? Why do they give and take bribes? One does not have to do great research and collect vast data to realise that whereas in the past, poverty was at the root of the upah or money- inducement culture, today the desire to make more money is at the root of bribe-giving and bribe-taking. Whereas in the past, the whole kampung would be in shame or malu if the policeman or mata-mata took a bribe or makan suap, today the community shrugs its shoulders and turns the other way. In other words, Malaysians have become a people who are highly tolerant of corruption. Today greed underlies the incidence of graft and corrupt practices among politicians and high level officials out to make big money when they are entrusted with authority. When opportunities for procurement abound in a country focused on development, people in positions of power consider it their privilege to be distributing the tenders and licenses for rewards in cash and kind. When enforcement officers tasked with implementing the law fall prey to corruption, the country is in dire straits. When the greed turns to avarice, the society is doomed. Much is contained in the National Anti-Corruption Plan (NAPC) launched recently. It is an expertly crafted master plan with a clearly-defined implementation framework and a precise roadmap charting the strategies and directions of Malaysia’s anti-corruption drive at the international, federal and state levels. Key to the NAPC’s success is the equally, if not more important goal of establishing good governance and integrity measures in priority areas such as political governance, public sector administration, public procurement, legal and judicial, law enforcement and corporate governance. Without a doubt the two goals of eliminating corruption and establishing stringent ethical standards are complementary. Their success or failure are mutually impactful. This raises what some may consider to be the mundane issue of executing an effective public campaign. It may seem redundant to repeat the claim that social media has the tremendously powerful potential of creating awareness and getting support. It might appear unoriginal to recommend the use of public spaces to launch the national anti-corruption blitz. Looking at the current support given to the Bossku campaign on social media should be enough to convince Malaysians that popular PR strategies work. Looking at the glee on the faces of the antagonists and their supporters should be sufficient to show us that ethics and morality are easily defeated by destructive elements in society. Turning the tide on a sound value system seems easy these days. Which makes it all the more crucial for the government to implement a powerful public campaign. Create an effective branding to make integrity fashionable. Use catchy slogans such as Trendy Integrity or Bribery Stinks, and use the faces of popular icons like Syed Saddique or Siti Nurhaliza to promote them. Town hall talks, government and corporate workshops on corruption must be supplemented with motorbike excursions of sports icons from town to town to wave the anti-corruption flag. Musical concerts and cultural performances must be preceded by Negara Ku and ended with a jig performed to a catchy integrity song. Introduce the fun element which goes down well with Malaysians. The anti-corruption war is a formidable one to fight a scourge which has become widespread and ingrained in society. Creative and innovative measures must be in place to reinforce official plans and policies. Zero tolerance for corruption must be the new attitude towards the endgame. * Datuk Halimah Mohd Said is the President of Association of Voices of Peace, Conscience and Reason (PCORE). 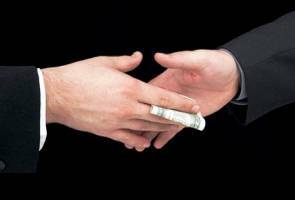 Corruption - Is there political will?